Choosing a gift couldn’t be easier for you and more delightful for them! 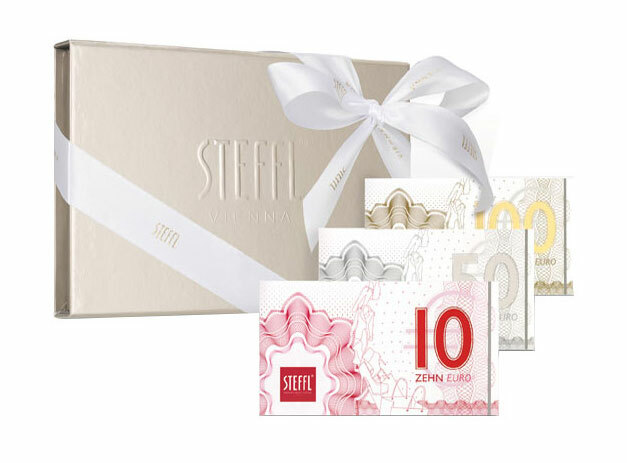 The STEFFL Voucher offers more than 70.000 gift possibilities and brings infinite joy to you and your beloved ones. The SKY Bar Restaurant is located on top floor 7 of Vienna’s lifestyle department store, Steffl. The dark, modern interior and the glass front offers breath-taking views of the capital’s vibrant urban scenery as well as the outskirts of the city with its hills and vineyards. 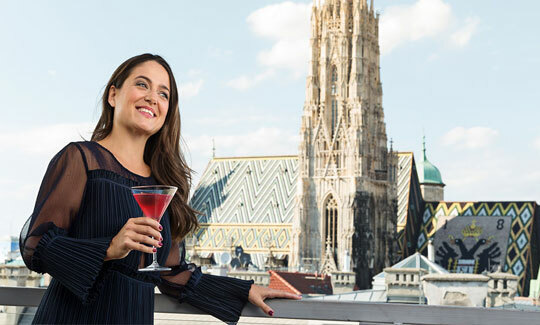 Enter into the Viennese spirit of taking time to enjoy the moment, chillax, savor a coffee or a cocktail on the roof terrace whilst gazing at the city skyline, amongst the penthouse rooftops, the Ferris wheel and the ‘Stephansdom’ – after which the STEFFL has lovingly taken its name. Feel on top of the world at the SKY Bar and Restaurant. The STEFFL Department Store is situated between the most famous sights of Vienna – St. Stephan’s cathedral and the Vienna State Opera. Located on Kärntner Straße, the STEFFL Department Store is in the heart of Vienna’s shopping center – next to a dense concentration of hotels, boutiques and the famous “Naschmarkt”. On over 9 floors, the STEFFL Department Store invites you to take your time when shopping in Vienna. The Kärntner Straße is renowned as the shopping center in the first district – it is an important part of the “Golden U”, connecting ‘Kohlmarkt’ and ‘Graben’ – the most exclusive shopping centers in Vienna. Here, in the city, the boutiques and shops display characteristic Viennese charm and are beloved by residents and tourists alike. All this, invites our customers to go shopping in the Viennese fashion… The side-streets surrounding STEFFL are home the most important international designer stores, exclusive boutiques, antique shops, art galleries and artisanal producers. At STEFFL, international flair meets Viennese style with a pioneering retail space with many different shopping experiences to discover. In addition to fashion and shopping there is still a lot more to discover. The terrace of the SKY Café and restaurant in Vienna is a real attraction for our guests. It is the only restaurant in “Wien”, where one can have a view of the newly renovated mosaic roof of Stephan’s cathedral and at night, the illuminated skyline of Vienna. Due to its central location, the STEFFL Department store can be easily accessed by public transport. The tube stations Stephansplatz and Karlsplatz are ideally located nearby, as are the connections by bus or tram.